LTO-8 BaFe MLM TeraPack (Custom)-10 LTO-8 BaFe tapes, Custom Barcode Labels, and TeraPack without Dust Cover.Visit www.SpectraLogic.com\barcode for mandatory label form.Capacity 12TB native. Why Buy Your Tapes from Spectra? Spectra Certified Media is carefully examined to ensure that it is reliable and meets our quality assurance requirements. 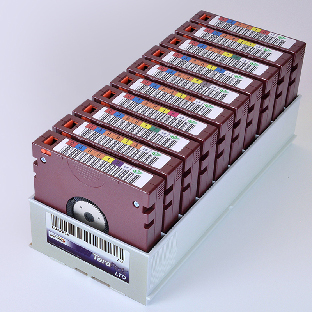 Unique to Spectra Certified Media, MLM records over 30 data points every time a tape is loaded, giving you vital statistical and diagnostic information to help proactively manage your tape inventory. This will allow you to identify at-risk tapes ready for retirement and to easily diagnose and resolve tape-related issues. An industry first, CarbideClean™ adds another layer of reliability by pre-cleaning your media before it is shipped, removing the tape debris left from the manufacturing process. Avoid the hassle of labeling your media. We pre-apply the barcode labels, which are available in custom or standard non-repeating sequences.